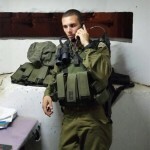 The operational company commander serving in the Givati Brigade, Captain Shir Klevner, 25-years-old from Tel Aviv, gave new meaning to what it means to be a personal role model. For the first time since his leg was shattered from a bullet of a Palestinian sniper during Operation Protective Edge eight months ago, he walked 10 kilometers at the firing ranges of Kibbutz Tze’elim in the Negev in a simulated training session that resembled renewed fighting within the Strip. Shir surprised more than a few people in his unit when he returned to his unit which he was forced to leave because of his wound during the summer war. After an intensive recovery period at the Sheba Medical Center, Shir’s participation at the training session at Tze’elim, which was aimed to resemble fighting against Hamas in the northern Gaza Strip, almost had some forget the fact that up until a few months ago he was limping from one physical therapy session to the next. Shir arrived in the south for the training session with his subordinate officers straight from Mount Hermon in the north, where he is stationed near the side of the mountain that borders with Lebanon – an area he has been in charge of since he returned to active service. “I need to be monitored, keep getting shots and treatments for the scar and the wound that remains, but I still do sports with the officers. My mind is very strong and I hope it will be stronger than my legs,” says Shir. “I haven’t walked such a long distance up until this training session and even had all the equipment. It was wonderful. I did not feel any pain – I felt strong. There is pain sometimes, but it’s okay, I can get by,” says Shir.